Reminder of what the rotor looked like below along with Bonus Exocet Picture below. Diagnosis of the brakes from the post a couple weeks ago? 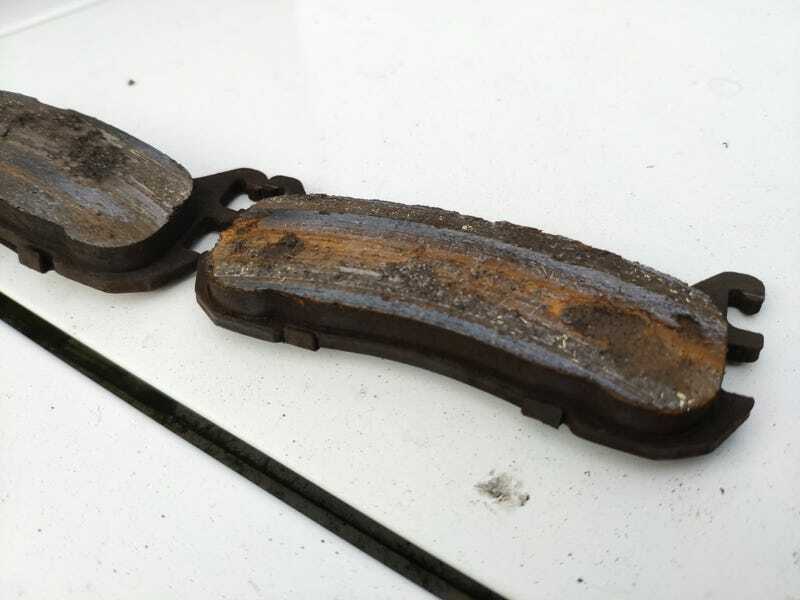 Bad caliper (despite being basically brand new), slight drag causing the brakes to overhead on long rides and repeatedly welding the pad to the rotor causing pad failure. Sigh. I leave for Scotland tomorrow so I’ll have to wait for parts until after next week. The hood isn’t exactly “on” per se. It needs some more alignment of the “measure twice, drill 3 times” variety. I’ll be doing some fancy design work to cover up my extra holes in the fiberglass. After spending about $150 on parts to try and get the gas filler neck to the right spot, I gave up and CAD’d a part for 3d printing in nylon (gas resistant). I got the handbrake, horn, cluster lights, intake air temp sensor, and trans tunnel done. Also added a bunch of little lights to meet CA road legality. Air filter: I got my air filter too close to my drill bit the other day and mangled it. I’m not heartbroken, since the filter didn’t quite fit right. The 70mm filter that does fit is $50 to ship here from the UK. Fortunately for me, I’ll be in the UK tomorrow! Woooooo! Cluster lights: I got a little overzealous with wire removal and accidentally deleted the dimmer that lets you turn on the cluster lights. They’re required in California. I plan on replacing the cluster after inspection, so I ended up drilling 2 holes in the back of the cluster and screwing a couple of LEDs to wire up. It’s kind of a hilarious hack. Exhaust: The car is too loud. It’s “next zipcode over” loud. Which, with all the California exhaust drama, is bad. I’m designing up a new exhaust with “sport mode” to open it up. It’s a bit hard to decide how much is too much or too little on paper. Handbrake: A bit of a pain since I had to remove the driver’s seat to do it. Big things left to do: Fenders (requires removing wheels/brakes), windshield (I acquired a manx buggy windshield with compliant glass to adapt), and potentially exhaust.